The final action of the 2016-17 season on Saturday saw AFC Kempston Town & Bedford College claim runners-up spot after taking their winning away run to five games with a 4-1 victory at Sharnbrook. Perry Ronayne, Tim Clarke, Elliot West and Taylor Bakogeorge scored the goals against a lone reply from Colin Slade. Finishing the season in third will be AFC Oakley M&DH who extended their unbeaten sequence to 11 games when winning 4-3 at newly crowned league champions Flitwick Town. Nathan Aulsberry with a brace was joined on the scoresheet by Dan Kelly and Matt Barnes against home Town replies via an own goal plus a brace from Josh Reynolds. Elsewhere, fourth place Caldecote were 5-2 home winners over Stevington. Twice behind in the opening half to goals from the visiting Tommy McGirl and Jordan Wright, they drew level with strikes from Oscar Smith and Jack Boyd before second half action saw an own goal plus goals from Jake Wallace and Martin Wells bring up the nap hand. This victory saw them push Wilstead into fifth place after they were beaten 3-2 at home by Renhold United. An own goal plus a brace from Ali Aamara marked the United scoresheet against home goals from Paul Jones and Shaun Winconek. The lone action of the afternoon saw Old Bradwell United Reserves run out 3-2 home winners over Cople & Bedford SA, Dre Neil netting twice and Charlie Wells once against a brace in reply from the visitors Ollie Hughes. Lea Sports PSG kept their slim hopes of making the top two alive by netting a 5-0 home win over Cranfield United Reserves. Jordan Yearwood with a brace was joined on the PSG scoresheet by Joe Hennem, Callum Jones and Ryan Darby to bring up the nap hand. 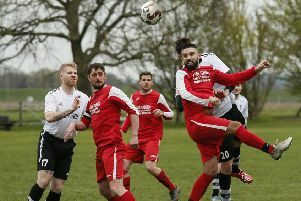 Flitwick Town Reserves will now finish the season in fifth after Potton Town failed to raise a side to meet them at the Football Centre and gifted them the three points. League champions Renhold United Reserves completed their season in extending their unbeaten record to 16 games with a 1-0 home win over Wootton Village thanks to a goal from Michael France. Wilstead Reserves duly banked runners-up spot after they maintained their unbeaten home record by sharing the points in a 2-2 draw with Bedford Albion who will now finish the season in third spot. Alex Russell netted both home goals against Albion replies via Paul Babbington and Adam Lewis. Henlow Reserves brought the curtain down on their 2016-17 campaign by romping to a 7-0 home win over Dinamo Flitwick. Russell Ayles with a brace joined on the scoresheet by goals from Sam Crow, James Campbell, Jonathan Rowe, Josh Izzard and Matt Rumbellow.